When I first heard the song, I fangirled as I was excited for new music from Jeremy Camp. After a few months, I was able to finally let the lyrics sink in. As I was listening to the lyrics, I realized that is how I wanted my life to be. I wanted to be reckless but not in the usual way reckless is used. I wanted to be like Paul in Acts 14. He was stoned, left for dead, left Lystra the next day, and came back to Lystra sometime later still preaching the Gospel. I wanted to be reckless for God, my life so abandoned to His will that it did not matter if I ended up losing my life in the process. 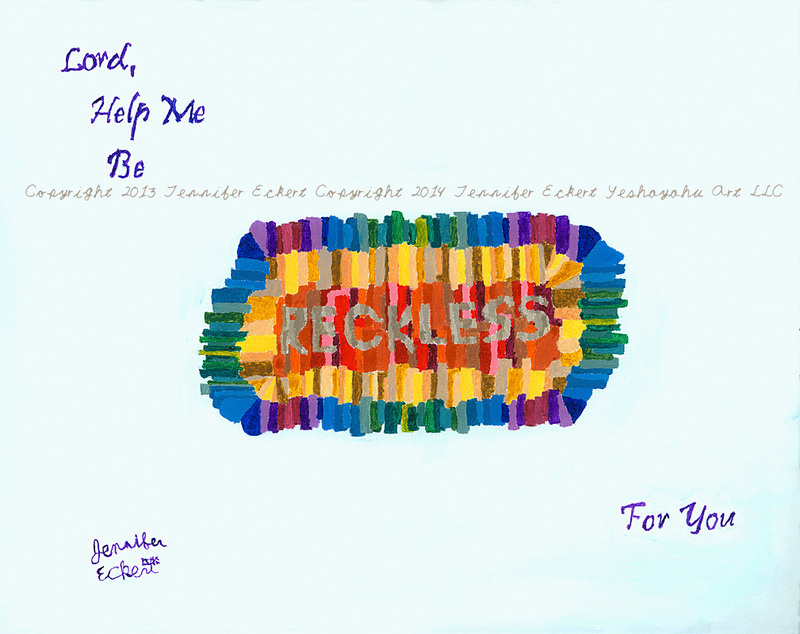 The painting is a visual expression of a prayer for my life. To view the print of this painting and my other artwork, please visit my online store. 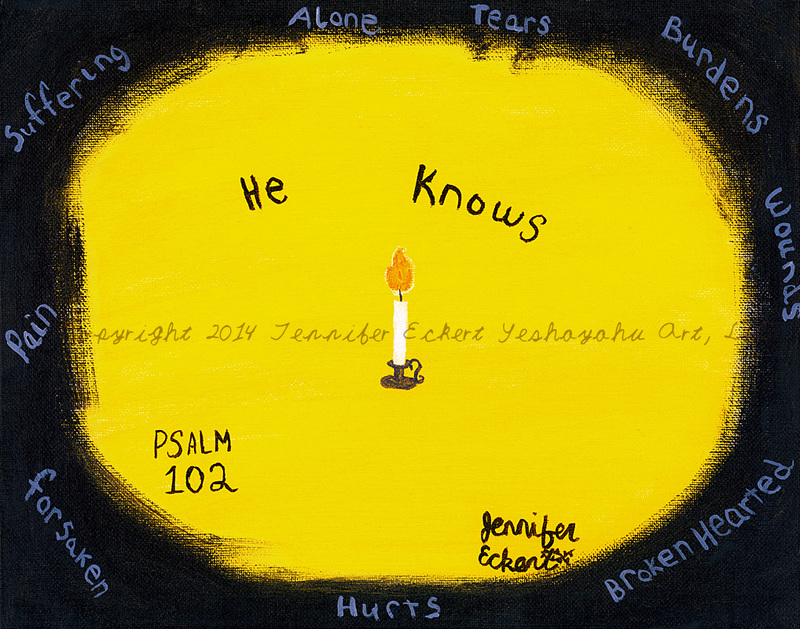 This is the “I wasn’t expecting this at all painting” also known as I what I came up with after hearing Jeremy Camp’s new single “He Knows” once on Air1 and then looking up the lyrics about 10 minutes later. I so needed that song the day I heard it. Tears started to well up in my eyes as I listened to it while heading home from some errands I had to run that morning. I came really close to crying. I know that song will be touching people’s lives even more so than it did mine that morning (and 4 days later when I broke down in tears while listening to it the 3rd time). That evening about 20 to midnight, the idea for the painting popped into my head. I had just finished reading the Sherlock story “The Blue Carbuncle” and was about to turn in. I grabbed my phone and quickly typed in the notes for how I wanted the painting to look. I even re-looked at the lyrics to make sure I had the correct thought process going. The next day (Sept. 13) I finished the border & flowers for the I Love You! – God painting and was deciding which painting to start next. I decided to go with the one for He Knows as I was still working on the drawing of Jesus for Free. The painting took about 3 hours to complete with distractions. The premise for it goes off the lyrics where it mentions all of the stuff we have gone through or felt that is negative/dark and that He knows all of it. The idea of a dark outer area and light in the middle was a reminder from the lyrics (although not directly mentioned) and from the Bible that what is done in secret or darkness will be brought to the light. I also remembered in the Gospels where Jesus mentions light casting out darkness and thought of a lit candle breaking up the darkness. 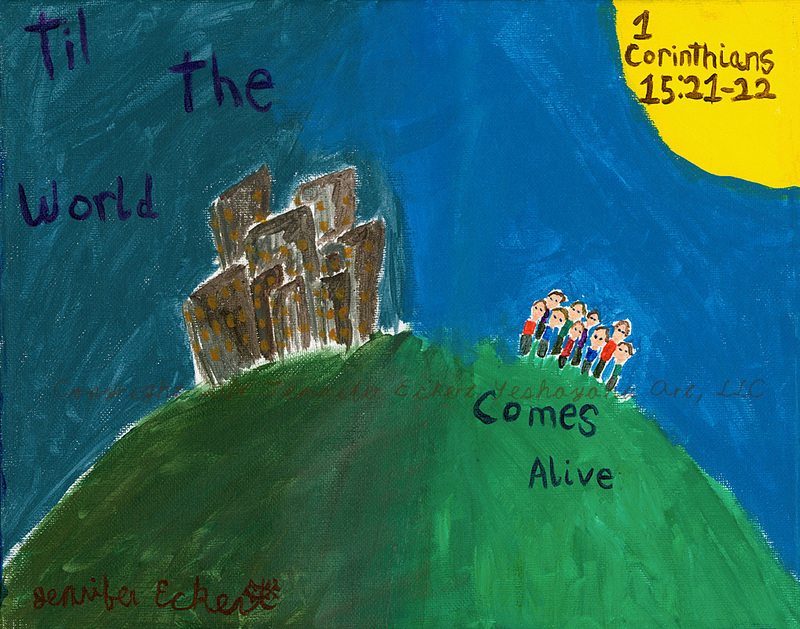 When I do these types of paintings, I generally try to find a Bible verse that goes with the song. If the album doesn’t say it (or is not out yet as was the case this time), I will try to find one that works or ask the artist directing when possible. For this painting, I found one that seemed to fit which is Psalm 102. It may seem odd to have such a verse when so much of the explanation of the painting seems to scream Mark 4:22. However, the psalmist bears his heart of suffering and his knowledge that God knows and understands. That He is there. August 30 I was coming home from helping Compassion International at the Hillsong concert when I was listening to Air 1. The DJ on that night (11pm or so) was talking about being set free by Jesus, yet wanting to go back to the chains that held him. While looking up the Bible verse I used for Come Alive I came across a perfect verse that would work with the song “Free” if I ever came up with a painting. Well, I did on that hour drive home. My initial sketch had a very freaky looking Jesus. Needless to say I worked on correcting that as being set free should not look scarier than being trapped by whatever is keeping us from God. As I have said before, my favorite musician is Jeremy Camp. He has seen photos of a few of my painting as many of my paintings are based on several of his songs. In July of 2014 I heard about a concert at my alma mater that I realized pretty quickly was during the university’s homecoming weekend. The concert included my favorite artist Jeremy Camp. I wanted to create another painting based on one of his songs and asked God for one. Within 10 minutes I had a sketch for his song “Come Alive”. I had it pictured in my head and figured out how I wanted to do it. The hardest part came to painting it as I knew how I wanted the buildings to look without using watercolor paints as I primarily use acrylic and the canvases I have are for acrylic or oil paints. I spent a week mulling it over in my mind not even touching the painting after I got the sketch transferred over to the canvas. I was able to get the paint thinned out enough to get the watercolor effect without the runny mess that can happen with watercolors. As I was painting the buildings, I determined they looked hideously awful which is what I wanted. The point of that half of the painting was to show a dark, drab, lost world while the other half was to kind of show a world that had come more alive as the colors are more vibrant and not dull, gray, and dreary. 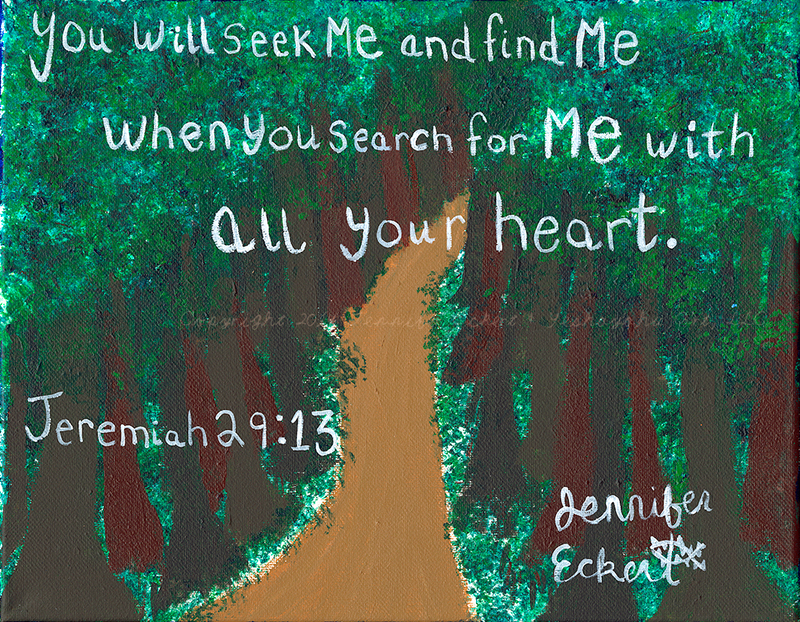 During the week that I was figuring out Come Alive and had come up with the painting for Don’t Forget, I Love You –God I was reading Jeremiah 29:13. It is a verse that I had read several years ago and had memorized for a few years. That week I referred to it often and still do quite a bit several months later. It is a verse that I have been meditating on. During that time of trying to seek God more, I had this idea for a painting. Over the years I had seen some photos that had a covered walkway that was almost like walking in a tunnel but with plants instead of concrete and stones. This verse kind of reminded me of those images. If we follow the right trail, we will find God. We need to remember to search for Him with all our heart. I’ve come to realize this year that within my passion for creating art, the deepest passion is painting art that helps draw others into a first time relationship with Jesus or if they already have a relationship, that it would be deeper. Some might consider it an expensive habit, but it’s one that I’m working on having as a business to support my son and I. I’m trusting God with the business as I have felt Him lay it on my heart to pursue and have seen so much confirmation on this route being the correct one. I have also seen so much spiritual warfare slowing me down with this business.